It’s time! You’re ready to open your heart and your home to a dog, and you’ve chosen to adopt — but how will you know which dog is The One? It can be difficult to decide which dog is right for you, especially if you’re choosing from hundreds of canines who all deserve a great family and lots of love. So how will you know which dog is your dog? Fortunately, you don’t have to just cross your fingers and hope it will all work out. I’ve helped guide hundreds of rescue dogs to successful lives with adoptive families, and my experience has taught me that while there isn’t a foolproof formula for selecting a perfectly compatible canine, a thoughtful approach to adoption is an important first step in a successful match. My advice is simple: The most successful adoptions are those where the humans are willing and able to adapt their lifestyle and environment to meet the needs of their new furry family member. But in order to do that, it is important to assess ahead of time what you can and cannot provide for a dog, and what you are looking for in your new canine best friend. I believe that almost every dog is fundamentally a good dog, and that those in a shelter or rescue are just waiting for homes where they can become great dogs. Before you head to the shelter or rescue to look for that potentially great dog, it’s important to assess your needs, lifestyle and physical abilities. These things are crucial to determining which dog will be the best fit for you. A good place to start is with the qualities you are looking for in a dog and the type of interactions you are expecting to have with him. If your home is a busy place, for example, with people (and pets) coming and going — children, neighbors, friends — then you will want to look for a social dog who gets along well with people and is able to tolerate a certain amount of chaos. If you are searching for a canine companion who has eyes only for you, though, you may prefer a less social dog who will stick close to your side. It is also important that you assess your ability to meet a dog’s physical and mental needs. Some breeds, for example, tend to require more daily exercise than others. Think about your schedule: How often will you be available for training, playtime and exercise with your dog? Do you have space — a fenced-in yard or nearby park — where your dog can get out and frolic? If you have a very small apartment, for example, a very big dog might not be the best choice for you — but if you work from home and can take frequent breaks for training and walks, you may be in a better position to raise a puppy. Knowing in advance what your options and limitations are can help you focus your search. Once you have a good sense of what you are looking for in a dog, it’s time to start researching available pooches. 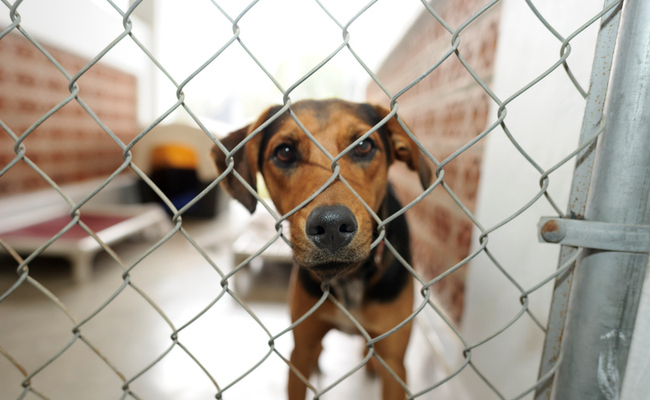 Shelters and rescues typically create a simple profile for each dog currently up for adoption; this profile, which is typically posted online or, in the case of an actual brick-and-mortar shelter, on the dog’s kennel, contains basic information about the animal. Once you find a dog you think will be a fit for your family, the shelter or rescue group can frequently provide a more detailed history, including the results of behavior evaluations that might have been done when he arrived at the shelter or rescue and any personality quirks the volunteers have observed as they have worked with him. The shelter or rescue may also be able to share information about the dog’s previous history. A dog’s history should not determine his future though. General descriptions from a prior home or behavior tests administered in a shelter can have major limits and often provide only a small glimpse into the dog’s personality. At the same time, they can offer a general idea of what the dog was like at a given point in time and help raise awareness of any special needs the dog has or any precautions that may need to be taken. Feel free to ask questions about the dog’s history or personality assessment. For example, if your new dog will be around children or other pets, it is important to know if he has had any experience with either and if that experience was positive or negative. Perhaps the best resource of all is to talk to the shelter staff — adoption counselors, volunteers or, if possible, the dog’s foster family — to glean more specific background information about the dog. These individuals are likely to know more about a dog than just what is in his basic description and may be able to provide some useful insight into his particular personality or habits. In some cases, in fact, they may be able to steer you toward another dog who would be a better fit for your lifestyle and home environment. Once you have decided to adopt, it’s important to recognize that some dogs may be a better match for your family than others. Finding the right dog is all about knowing what you can offer — and that includes a loving heart and a forever home. ADOPT DON?T SHOP. Good advice and Thanks on behalf of all those furry friends waiting for a forever Home. I found a great shelter dog! The right one is out there, so find him/her!